The sociability of social networking sites such as Facebook is built upon an archive of memories. Facebook trades in memory in at least two ways. On the one hand, and perhaps especially for older users, Facebook is platform that facilitates the search for memories. Old friends and old flames can be found on Facebook. Reconnecting with a high school buddy activates a surge of interconnected memories that lead to other long forgotten memories and so on. On the other hand, and this perhaps especially for younger users, Facebook also renders present experience already a depository of potential memories. The future past impinges upon the present. Our experience is a conducted as a search for memories yet to be formed which will be archived on Facebook. In a sense then we hunt for memories past and, paradoxically, for memories future. This post is the second in a series situating Facebook within the memory theater/arts of memory tradition. In the first post I set the stage by describing how social networking sites and internet enabled smart phones have constituted experience as a field of potential memories. I also suggested that how we store and access our memories makes a difference. The cultural and personal significance of memory is not a static category of human nature. Memory and its significance evolve over time, often in response to changing technologies. So the question, then, is something like this: What difference does it make, personally and culturally, that Facebook has become such a prominent mode of memory? In order to explore that question, I’ll delve briefly into the history of the art of memory, a set of memory practices with which, I believe, Facebook shares interesting similarities. But as promised at the end of the last post, we’ll start with a story. [Simonides] inferred that persons desiring to train [their memory] must select places and form mental images of the things they wish to remember and store those images in the places, so that the order of the places will preserve the order of the things, and the images of the things will denote the things themselves, and we shall employ the places and images respectively as a wax writing-tablet and the letters written on it. Imagine, then, for the sake of argument, that our minds contain a block of wax, which in this or that individual may be larger or smaller, and composed of wax that is comparatively pure or muddy, and harder in some, softer in others, and sometimes of just the right consistency. Let us call it the gift of the Muses’ mother, Memory, and say that whenever we wish to remember something we see or hear or conceive in our own minds, we hold this wax under the perceptions or ideas and imprint them on it as we might stamp the impressions of a seal ring. Whatever is so imprinted we remember and know so long as the image remains; whatever is rubbed out or has not succeeded in leaving an impression we have forgotten and do not know. 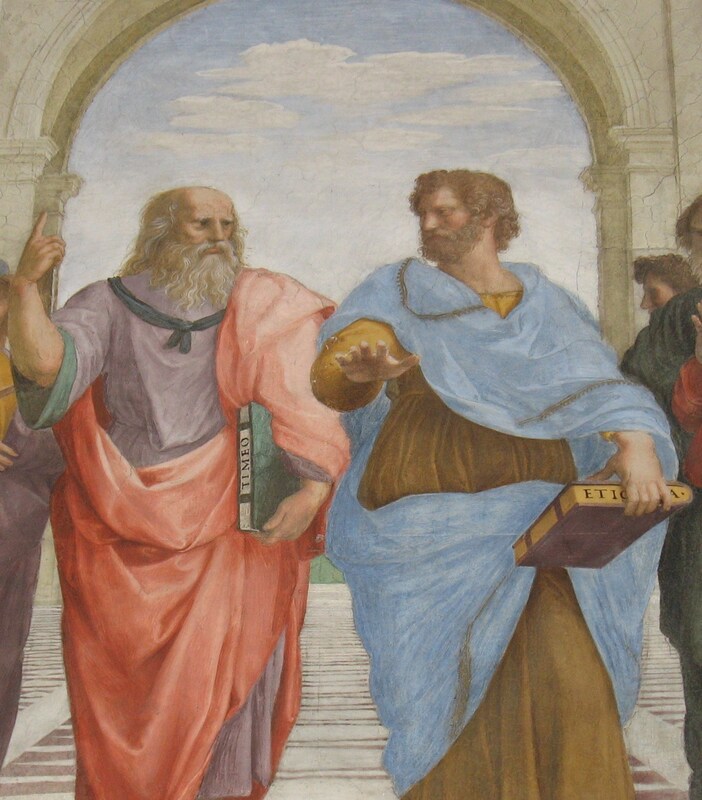 Plato and Aristotle in Rafeal's "School of Athens"
The Platonic understanding of memory was grounded in a metaphysic and epistemology which located the ability to apprehend truth in an act of recollection. Plato believed that the highest forms of knowledge were not derived from sense experience, but were first apprehended by the soul in a pre-existent state and remain imprinted deep in a person’s memory. Truth consists in matching the sensible experience of physical reality to the imprint of eternal Forms or Ideas whose images or imprints reside in memory. Consequently the chief aim of education is the remembering of these Ideas and this aim is principally attained through “dialectical enquiry,” a process, modeled by Plato’s dialogs, by which a student may arrive at a remembering of the Ideas. At this point, we should notice that the anteriority, or “pastness,” of the knowledge in question is, strictly speaking, incidental. What is important is the presence of the absent Idea or Form. It is to evoke the presence of this absence that remembering is deployed. It is the presence of eternal Ideas that secures the apprehension of truth, goodness, or beauty in the present. Locating the memory within the span of time past does not bear upon its value which rests in its being possessed as a model against which to measure experience. Socratic philosophy bequeathed to us two rival and complementary topoi on this subject, one Platonic, the other Aristotelian. The first, centered on the theme of the eikōn [image], speaks of the present representation of an absent thing; it argues implicitly for enclosing the problematic of memory within that of imagination. The second, centered on the theme of the representation of a thing formerly perceived, acquired, or learned, argues for including the problematic of the image within that of remembering. Reflecting for just a moment on the nature of our own memories it is not difficult to see why this might be the case. If we remember our mother, for example, we may do so either by contemplating some idealized image of her in our mind’s eye or else by recollecting a moment from our shared past. In both cases we may be said to be remembering our mother, but the memories differ along the Platonic/Aristotelian divide suggested by Ricoeur. In the former case I remember her in a way that seeks her presence without reference to time past; in the latter, I remember her in a way that situates her chronologically in the past. At this point, I’m sure it seems that we’ve wandered a bit from the art of memory and father still from social networking sites. There is a method to this madness, however, but demonstrating that will have to wait for the next post. Already, I am pushing the limits of acceptable blog post length. Exploring memory as an index of desire. Setting the art of memory tradition, and Facebook, within Ricoeur’s schema. Asking what difference all of this makes.